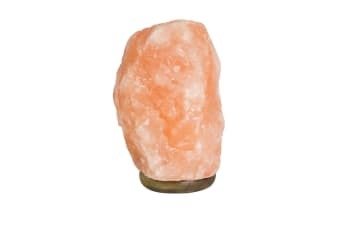 Create a relaxing ambience in your home, purify air and counteract harsh artificial lighting with the therapeutic glow of an authentic Himalayan salt lamp. Perfect for relaxing and winding down at the end of the day, this gorgeous, rosy amber Himalayan Salt Lamp is a welcome change from the harsh, disruptive blue light emitted from your phone, TV or computer. Ideal for a living room or office space, place your salt lamp near your electricals to help minimise the effects of electrical radiation and reduce Electromagnetic Field (EMF) pollution. When the lamp is heated, the salt emits negative ions that counteract ‘pollutive’ positive ions in the air. When not switched on, your salt lamp absorbs moisture from the air and may ‘cry’ or ‘sweat’. To protect the lamp and the light bulb, simply wipe dry inside and out before switching on again. To minimise the amount of moisture absorbed, position it away from open doors and windows. Place your salt lamp on a protective mat or a ceramic, marble or glass plate to protect your furniture. Please note: due to the nature of the product, its weight, shape and salt colour may vary. 1 × 10-12kg Natural Salt Lamp with SAA Cable and Globe. Plus 1 extra free globe.